Use Google Analytics to analyze where your Social Media traffic comes from, and how to improve the landing pages that your Social Media visitors arrive on. Now that you know where your social media referral traffic is coming from and where it's landing, you've got a good starting Social Media report. This only provides insights into users once they've hit your site - so you may wonder what's happening to your content on the Social Networks themselves. What social content is getting the most traction (and might be going viral)? The data from the prior tutorial is a perfect starting point for understanding how our content is being shared using SharedCount, a service that allows you to see the total Facebook, Twitter, Google Plus, Stumbleupon, Pinterest, and LinkedIn shares for a given URL. Now, open your Blockspring Console and find the SharedCount block. Copy the first URL from column A to the URL parameter and insert into the next cell over from the first URL. Now that you have a Blockspring function generated for the first URL, go into the formula bar and delete the hard-coded URL (with cnn.com) and replace it with the cell name (e.g. B2). The output of the Blockspring contains #SPECIAL, meaning we’ll have to do a bit more work. The text of the cells tells you to select the cell, and then click View Cell in the Blockspring Console. This will give you all of the options to output from various different Social Networks the content is shared on. Let’s focus on LinkedIn for the time being. Select the empty cell to the right of #SPECIAL (e.g. D2), scroll down to the LinkedIn section in the Blockspring Console, and click “Insert into cell”. This will place the LinkedIn result into the sheet. If you want to look under the hood, the formula bar now shows a new way to access the data in the #SPECIAL cell which you can learn more about on the Google Sheets help page. Otherwise, you can just select the items you want from the Blockspring Console and be done with it. All that’s left is to run the same process on the rest of your URLs by dragging the formulas down on the corresponding cells. By repeating the process with all the Social Networks that you care about, you now have data on the most shared content on your webpage or blog. Now that we understand the number of shares that the pages on our website have had on Social Networks, it’s natural to ask a follow-on question like: which of my pages are effective in sending traffic to my site? This analysis can help you identify popular content that gets shared a lot but doesn’t result in visits (so maybe you can improve the Call to Action?) or content that’s effective in driving traffic but undershared (which you could try to make more viral). To get started, we’ll need to integrate the data we have from Google Analytics and SharedCount. Copy your list of landing pages and their corresponding number of sessions into a new tab. Now, create a VLookup to insert the Session data from each URL into your original tab. Now that you have the data all in one place, start to look for content that has been highly shared but has low conversion rates - especially useful if you used Goal Conversion metrics in the previous tutorial. Content that gets shared readily but doesn't convert often needs a better "call to action", so take a look for opportunities like that as well. You can also use a simple ratio of Sessions to Shares (or create a more complex metric on your own) to develop actionable insights for optimizing your social media content! Take the analysis a step further to figure out which Social Networks send you the most valuable traffic. You can do this by including Goal Conversion or similar metrics in your Report. Look for outliers in terms of content performance - what might have caused these pieces of content to perform so differently? Can you repeat the wins or avoid the mistakes? Connect your Google Analytics data to other analytics services that cover the Social Networks directly, like Facebook Insights and Youtube Analytics. 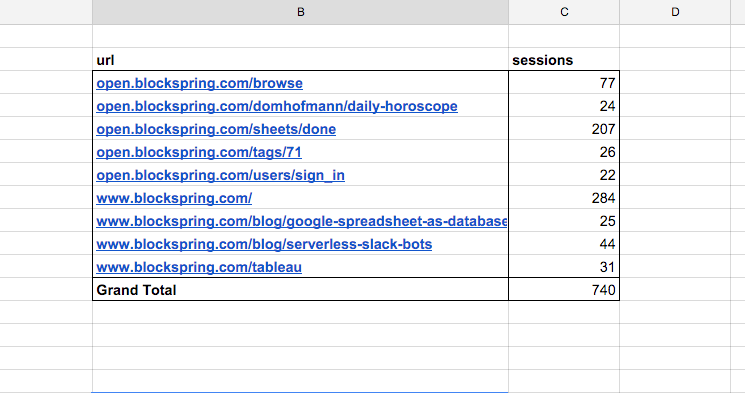 You can make these connections directly in the spreadsheet, and get a more complete picture of what's driving traffic and how you can optimize your efforts. We’re only getting started. There are a number of other things you can do with this data, such as segmenting out a specific subset of URLs that you care about, auditing all the links on your site (not just the ones with visits during the time period you care about), or using a similar approach to analyze how effective the social sharing of content on other sites is. Thanks for using this tutorial series - we'd love to hear your feedback! Did something not make sense at all or think you have a better way to explain a concept? Maybe you want some more information about how to make Blockspring work for you? Or perhaps you use other tools or services that you’d like to see Blockspring explore?